Saturday, April 2nd, 2016. Game Studies SIG Workshop Editor’s Roundtable on Game Studies Book Series. Society for the Study of Cinema and Media Annual Conference, Atlanta, GA, March 30th – April 3rd, 2016. Thursday, February 25th, 2016. “Designing Atari’s Coin-op Machines, 1972 – 1979.” 7:00 p.m. Public Talk part of the “Arcade Age” exhibition at The Cradle of Aviation Museum. 1 Davis Avenue. Garden City, NY 11530. Saturday, September 12, 2015. “Atari Modern: Coin-Op Arcade Cabinet Design, 1971 – 1974.” Video Games as Design History Panel. Design History Society Annual Conference. California College of Arts, San Francisco, CA. Saturday, October 10, 2015. History of Video Games as History of Technology?” Round-table panelist. Society for the History of Technology Annual Conference. Albuquerque, NM. Friday, May 29, 2015. “Video Games and Design History.” Interactive Media and Games Seminar. Stanford University.Palo Alto, CA. .
Saturday, March 28, 2015. “Ping-Ponging Between Interaction Design and Industrial Design.” Inclined by Design:Engagements with Material Interfaces Panel. Society of Cinema and Media Studies Annual Conference, Montreal, Canada. November 19, 2014. 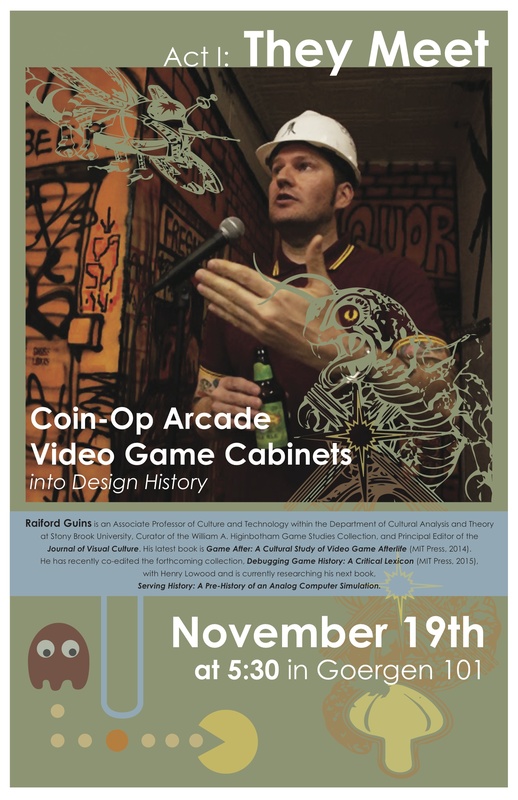 “Act 1: They Meet – Coin-op Arcade Video Game Cabinets into Design History.” University of Rochester, NY. September 18 – 19, 2014. “A Cultural Studies of Design?” Design Culture: object, discipline and practice. International Conference, University of Southern Denmark. March 19 – 23, 2014. “Marshall McLuhan’s Understanding Media: The Extensions of Man @ 50” Workshop co-organized with Charles R. Acland. Society of Cinema and Media Studies Annual Conference, Seattle. October 22, 2013. “When Games Went Click: The Story of Tennis For Two.” Invited Documentary Screening and Discussant, NYU Game Center, Brooklyn NY. October 18, 2013. “Curious Cabinets.” Invited Opening Plenary Speaker. Containers: The 4th Annual Graduate Student Conference, Department of Cultural Analysis and Theory, Stony Brook Manhattan. October 10 – 13, 2013. “Design and Designation: The History of a Curious Appellation for an Analog Computer Tennis Simulation (or, how Brookhaven National Laboratory’s Tennis Programming No. EH1-900-1-3 a.k.a Tennis For Two got its name).” Society For the History of Technology 2013 Annual Conference, Portland, Maine. October 4 – 5, 2013. “‘A Simplified Family Setting’: Parent Controls, Game Consoles, and Morality by Design.” Speaker and Panel Participant at “The Stuff Between Us: Designing Interactions Beyond the Object,” Design Symposium, Zurich University of the Arts, Switzerland. Friday, March 8th, 2:15 – 4:00. “Debugging the History of Game Terminology II: Critical Studies of Key Concepts Panel”. Society of Cinema and Media Studies Annual Conference, Chicago, March 6 – 10, 2013. My paper will be on the etymology of the term “game console”.